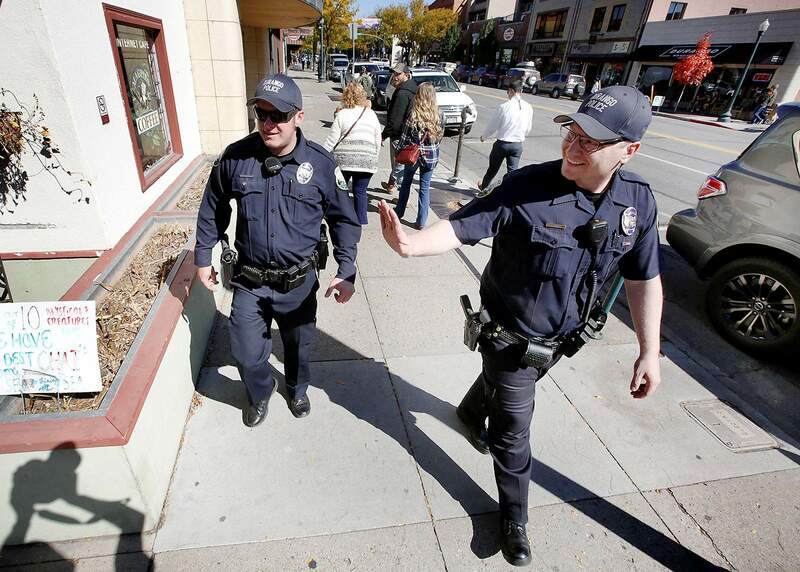 Durango Police Department officers Ethan Harper, right, and Andy Kaplan greet people along Main Avenue in downtown Durango in October. 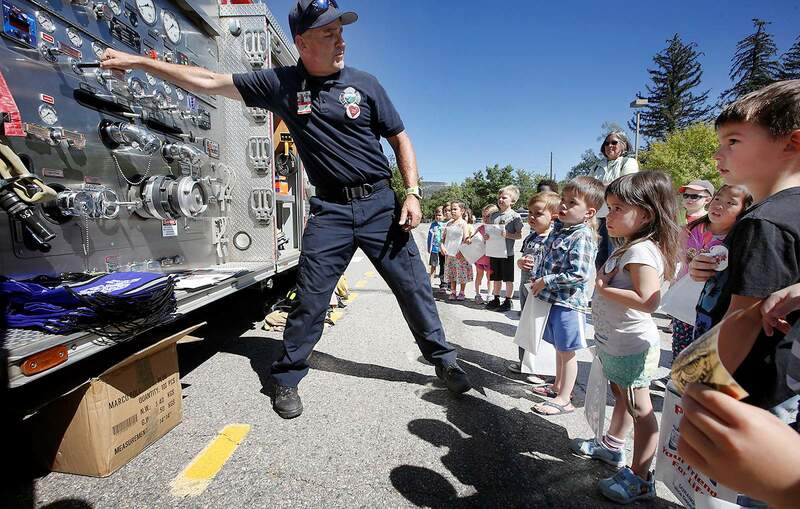 Scot Davis, with Durango Fire Protection District, describes how a fire engine works during the Durango Police Department and DFPD Police Car and Fire Truck Show and Tell, put on by the Durango Public Library in September. Police departments across Colorado and nationwide are working more closely with residents on crime prevention and reporting, and more officers are wearing body cameras in an effort to build public trust and increase transparency, according to a statewide survey. The Colorado Municipal League’s 2018 State of Our Cities & Towns Report looks at essential services in communities across the state, and it finds that police, fire and emergency medical services are increasingly efficient in serving residents. Innovations such as community wildland fire protection plans are reshaping municipal fire departments. The survey found 48 percent of fire departments participate in a community wildland fire protection plan, including Durango Fire Protection District. DFPD Chief Hal Doughty said La Plata County has a well-defined emergency operations plan that covers wildfires and other disasters. Many individual neighborhoods, such as Durango West I and II and Rockridge subdivisions, also have specific plans, he added. After a property tax increase for DFPD won by a landslide in November, residents will pay higher property taxes for additional fire staff, new fire stations and a training facility. Doughty said the fire district budgeted for a new ambulance and two new fire trucks this year, and eventually, DFPD plans to increase the number of people working each day from 18 to 26. The Municipal League survey also found 52 percent of fire departments face challenges recruiting volunteers. Doughty said recruiting is “incredibly difficult” for the agency. DFPD has 74 full-time employees and averages about 80 volunteers, although that number fluctuates weekly. “We spend a ton of time and finances on recruiting and sustaining volunteers, including hiring a full-time captain position that the crux of his job is recruiting, retaining and managing our volunteer program,” Doughty said. Volunteers help when there is a major incident or when there are additional staffing needs during events such as Snowdown. Volunteers also help educate the community, Doughty said. Recruiting is also a challenge for police departments. The survey says 69 percent of police departments report difficulty recruiting new officers. But Durango provides a different picture. The Durango Police Department is fully staffed with 55 officers. The survey also reports that in recent years, more officers are saving lives, especially in drug-overdose situations. Forty-seven percent of police departments use opioid revival drugs. Durango Police Chief Kamran Afzal said every officer on patrol carries Narcan, a reversal agent for opiate overdoses. “(Narcan) is extremely helpful because it absolutely saves lives,” he said. The survey also found 51 percent of police departments use officer-worn body cameras, and 21 percent plan to soon. This summer, DPD will acquire body cameras and replace outdated dashboard cameras in its police cars. The department will spend $80,000. He said some people may change their behavior during police-civilian interactions when a police camera is used. The department is always looking for new ways to interact with and educate the community, Afzal said.